Creed II is a 2018 American sports drama film directed by Steven Caple Jr., and written by Juel Taylor and Sylvester Stallone, from a story by Sascha Penn and Cheo Hodari Coker. 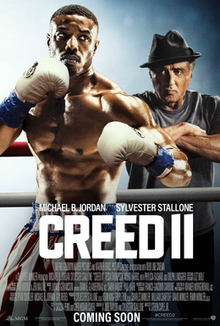 A sequel to Creed (2015) and the eighth installment in the Rocky film series, it stars Michael B. Jordan, Sylvester Stallone, Tessa Thompson, Dolph Lundgren, Florian Munteanu, Wood Harris, and Phylicia Rashad. Creed writer-director Ryan Coogler serves as an executive producer on the film. The film follows a fight over 33 years in the making, as Adonis Creed meets a new adversary in the ring: Viktor Drago, son of Ivan Drago, the powerful athlete who killed Adonis’ father Apollo Creed. A Creed sequel was confirmed in January 2016, although due to both Coogler and Jordan’s involvement in Black Panther, the film was delayed, with Coogler ultimately being replaced by Caple. Stallone completed the script in July 2017 and announced Lundgren would be reprising his role as Drago, and filming began in Philadelphia in March 2018, lasting through July. Creed II was released in the United States by Metro-Goldwyn-Mayer Pictures on November 21, 2018. The film has grossed over $93 million and received generally positive reviews from critics, who praised the cast and character development, calling it a “solid, if predictable” sequel. Three years after his loss to “Pretty” Ricky Conlan, Adonis Creed scores a string of victories, culminating in a victory over Danny “Stuntman” Wheeler (Andre Ward) to win the WBC World Heavyweight Championship. Now a worldwide star, Adonis proposes to his girlfriend, Bianca Taylor, who agrees to marry him. When Bianca suggests starting a new life together in Los Angeles, Adonis is reluctant to leave his life behind in Philadelphia. Meanwhile, Ivan Drago, a former Soviet boxer who killed Adonis’s father, Apollo Creed, in the ring thirty-three years earlier, sees an opportunity to regain the glory that was taken from him as a result of his loss to Rocky Balboa in Moscow later that same year by pitting his son, Viktor Drago (with the assistance of Buddy Marcelle, a promoter who has followed Viktor’s career closely), against Adonis. When Rocky refuses to support Adonis’s decision to accept Viktor’s challenge, Adonis, feeling betrayed, decides to leave for Los Angeles. Adonis and Bianca settle down in a luxurious apartment in Los Angeles close to Adonis’s adoptive mother, and Apollo’s widow, Mary Anne. As Adonis and Bianca adjust to their new life on the west coast and prepare for the upcoming match with Viktor, Bianca learns that she is pregnant. Adonis recruits Tony “Little Duke” Evers, son of his father’s trainer, as Rocky’s replacement. Overwhelmed with all the recent developments in his life, Adonis rushes into the match, getting himself badly injured. Viktor is disqualified for hitting Adonis while he is down, allowing Adonis to retain the World Heavyweight Championship. His body and ego shattered, Adonis becomes increasingly disconnected from Bianca. Mary Anne reaches out to Rocky in hopes of having him come to help Adonis out of his slump; Rocky arrives, he and Adonis make up, and Rocky agrees to train Adonis properly for a rematch against Viktor. Viktor, with his newfound popularity, is suffering near-torturous levels of physical tests by his father. At a State Dinner, he and Ivan meet Ludmilla, his mother, and ex-wife, for the first time several years after she abandoned both of them after the loss to Balboa. Bianca gives birth to a baby girl, and they name her Amara. Adonis and Bianca’s fears are realized when their child is born deaf, inherited from her mother’s progressive degenerative hearing disorder. While Viktor continues to taunt Adonis publicly, he is constantly pressured by his father to regain their honor. Rocky takes Adonis to a decrepit location in the California desert to retrain, describing it as a place where fighters are “reborn”. Adonis undergoes a rigorous and brutal training regimen with Rocky, focusing on fighting from the inside and training his body to repeatedly absorb the heavy impact he knows he’ll receive from Viktor in the ring. The rematch in Moscow is considerably more balanced as a more controlled and focused Adonis exchanges equal blows with Viktor. Since Viktor is accustomed to winning all of his fights by knockout, his fights have never lasted beyond the fourth round, something that Adonis uses to his advantage as he endures Viktor’s punishment deeper into the match, even after his ribs break again. In the tenth round after being knocked down again, Adonis unleashes a furious rage, managing to land sequence after sequence of effective blows, knocking Viktor down twice. Viktor’s mother Ludmilla, who had been sitting ringside with some of Viktor’s supporters, departs when the tide of the fight shifts in Adonis’ favor, knocking Viktor off-balance emotionally. Ivan notes this as well, coming to terms with earlier statements made by Viktor regarding the fair-weathered nature of the same supporters who had run Ivan out of Russia. With Viktor cornered and receiving multiple strikes without returning any blows, Rocky watches in amazement as Ivan makes his way to where his son is cornered. Ivan throws in the towel, conceding the fight to Adonis to ensure his son isn’t seriously injured or killed. Though Viktor is ashamed, Ivan assures Viktor it is okay that he lost, and embraces him. As Bianca enters the ring to celebrate with Adonis, Rocky recuses himself from joining them. Telling Adonis that it is “his time”, he takes a seat and watches them from outside the ring. Viktor and Ivan are later training together back in Ukraine. Rocky travels to Vancouver to make peace with his own estranged son, Robert, and meets his grandson Logan for the first time, noting how much he looks like Adrian. Adonis visits Apollo’s grave where he makes peace with his deceased father and the burden of carrying on his legacy, as he and Bianca introduce him to his granddaughter, who is sporting new hearing aids. Copyright © 2019 Cinemagz. All Rights Reserved.